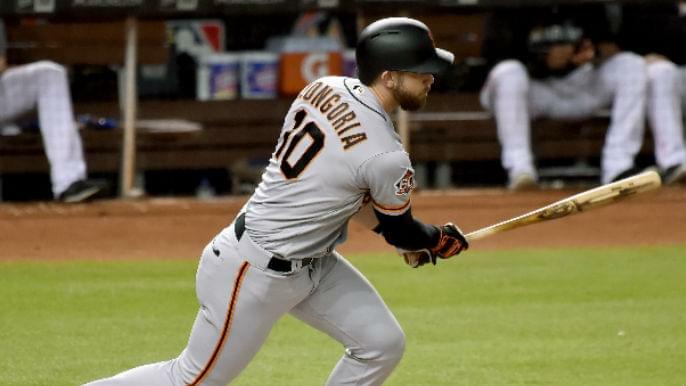 Evan Longoria is the latest Giant to take a trip to the disabled list, after fracturing his left hand in yesterday’s 16-inning battle with the Marlins. Longoria broke his fifth metacarpal after taking a pitch off his hand in the fourth inning. This is the same injury Madison Bumgarner sustained during spring training when he took a line drive off his hand. While both players injured the same part of their hand, Giants beat writer Henry Schulman highlighted why Longoria’s recovery could be shorter, when he joined Tolbert & Lund Thursday afternoon. Along with the injury being slightly different, Schulman also mentions his rehab likely being easier. With Longoria now out, that leaves a hole in the Giants defense at third base. Schulman believes that spot will likely be filled by mainly Pablo Sandoval as he is a natural third baseman. However, if Pablo moves to third, who will then take over first base? Brandon Belt, who had an emergency appendectomy two weeks ago, started his rehab assignment Monday in Arizona. Listen to the full interview below. To hear Schulman on Longoria, start at 2:30.